Few tattoos have more complicated meanings than spider web tattoo designs. Whether you are drawn to the intricacy of the web, or its implied struggle a spider web tattoo has a lot of meaning. While times have changed, and with them the original meanings of the spider web design has changed, the image still holds a lot of controversy and intrigue for many. The roots of the spider web tattoo are twofold, dating back more than 70 years in popular culture; prison and Aryan affiliation. Getting a spider web tattoo design inked in prison was one way that inmates who were in for years could mark their status. Each year the inmate was incarcerated, the image of the spider web grew by one strand. Frequently, the web was placed over an elbow or on the shoulder, radiating out from either of these natural, circular points. 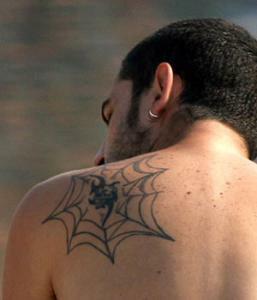 Members of street gains, and people with Aryan affiliation also used the spider web design in tattoos. In these cases, each ring of the web designated a murder, crime or other mark of passage within the gang or web. Like all tattoos today, the image does not have to mean anything but what you bring to it. Whether you enjoy the symmetry of the web, or it has a greater meaning for you, there is no need to attach past records to the image. There are, however, several other meanings that have grown up around the image in recent years. The fly trapped in a spider's web is a frequent symbol of a struggle with something that has a hold on you. 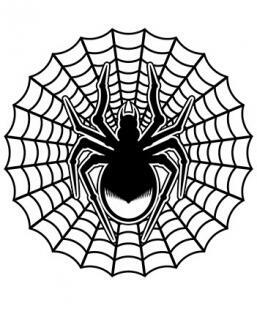 Those struggling with alcohol or addiction will frequently get a spider web tattoo to symbolize their fight. The image of the spider web is also popular amongst bikers who feel it symbolizes being caught in life's web of fate. To struggle against the hand dealt you can be the deeper meaning. Feelings of entrapment or a feeling of being somewhere you don't feel is the ultimate place for you can be symbolized by a spider web tattoo. 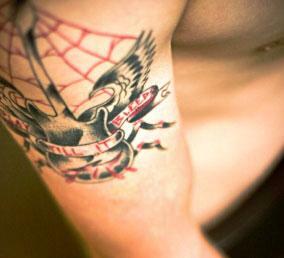 A spider web tattoo on the elbow may also mean a sailor leaning against the side of the boat. He has waited for home for so long that a cobweb has grown up from this spot. This meaning continues to permeate culture today, with the elbow being one of the most frequently used places to display a spider web. In recent years, musicians such as Robert Van Winkle and Lars Frederiksen have been seen to sport spider web tattoos for no reason other than they enjoyed the look. This type of popular culture use has taken away some of the former meanings, opening the design to more people. 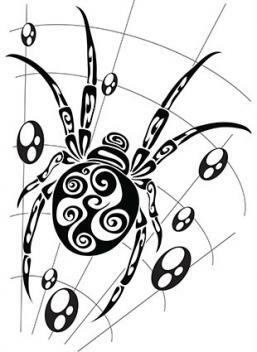 Spider web tattoo designs are a personal way to express struggle or inner turmoil. Think carefully on its use and placement before wearing to ensure its meaning is right for you.